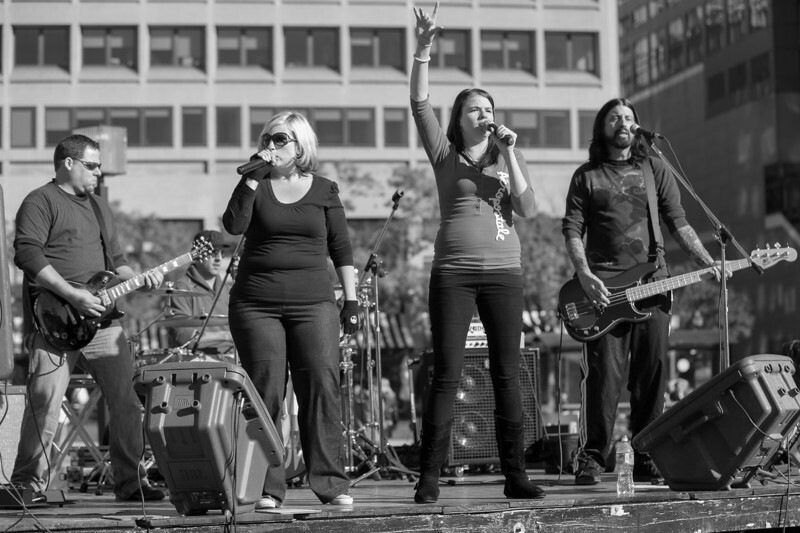 The Prestige Worldwide Band played at the 2012 Baltimore Marathon. I know nothing about them except they had pretty decent music. The concept was to create excitement in the crowd of spectators and to keep the runners excited about the marathon. They did a good job! At the location they were set up, the marathoners (26.2) were at the halfway point and it was the start of the half marathon. They were in tune, they knew the words of the songs they were singing and if you look close at the drummers ear you can see they use professional audio equipment. When I looked at their website - they looked like a busy band. Not to really promote them but I did find their website at http://www.prestigeworldwideband.com/. Anyway -- I took a few quick shots. It was fun to listen to them.